The time has come to depart! I am (almost) ready to travel to France. I have my communications almost sorted out, my accommodations set, my transportation ready and waiting. Of course it feels like I still have 100 things left to do, but that doesn't stop me from having a dinner party tonight, yes the night before I leave for 5 weeks. How joyously crazy is that? Even though the weeks ahead are unknown outside of a framework of locations, I am so grateful to have the freedom to go. I am thankful to my family (who make it possible), house-sitter friend, and other friends who have encouraged me to go for it. I look so forward to my journey. Why would I want to go anywhere else? Why would I want to ride a bike anywhere other than France? These questions are not really questions, but statements. I love riding in France. I like thinking about it in future present and past tense. I simply like the style of being in France. I am also going to the Tour de France for a 6th time in 2010. If you are in France look for me. I will (not being wearing my new team kit which did not arrive in time, bummer) be wearing nondescript black and white clothing on a very flashy black and yellow Scott bike. I will be one of a zillion fans at Stage 13, 14, 15, 16, 17, 18, and 20 of the 2010 Tour de France. The rest of the time I will be wandering about in the Pyrenees. I will be posting stories and images of my travels. I will be staying in Saint Savin, Gan, Arrens-Marsous, Biert, Crechetes, Guchan, St-Martin-le-Vieil, Saint Mamet, Beaucens, Paris, Toulouse - here I come! And I will be seeing how fast and how slow I can ride up some of these climbs: Col d’Agnes, Col de Ares, Col d'Artigaux, Col d'Azet, Col de Buret, Col de la Core, Col des Marrous, Col de Mente, Col de Pailhères, Col de Port, Col de’Portet d Aspet, Col du Portillon, Col de Tramassel, Horquette d’Ancizan, Lac d'Estaing, Pla d’Adet, Plateau de Beille, Spandelles, Superbagneres. And a few repeats up Col du Tourmalet, Col d'Aspin, Col du Peyresourde, Col d'Ichere, Col de la Marie Blanc, Col du Soulor, Col d'Aubisque, Luz Ardiden, Hautacam. And perhaps by the time I return to the USA I will better remember when and why some of these climbs are Col du, Col de, or Col de la. Col d' - well that's any easy one. 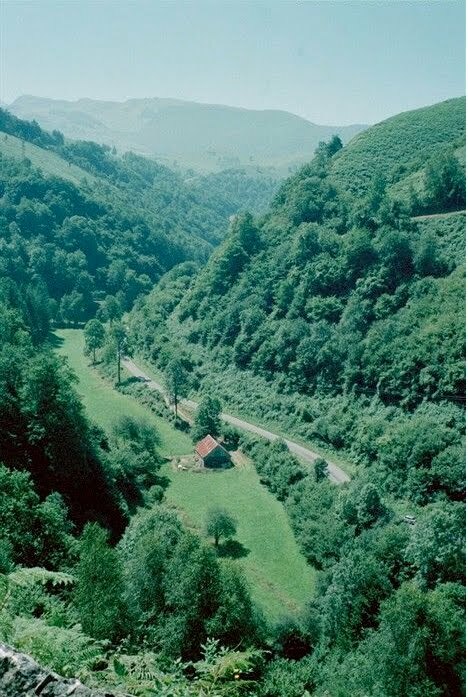 One of my favorite pictures of France, the road east of Lourdes heading to Bagneres-de-Bigorre. What an amazing experience to be on that road on a bike.